As a preschool teacher I always include community helpers in my dramatic play area, but I also realized that it was important to intentionally teach what the community helpers roles were in our lives. Talking about police and firemen are two topics that are especially important because young children might be frightened by their uniform or by misinformation they have heard. Teaching that police officer’s role is to serve and protect might bring up conversations or questions that the children have. Children who have (or had) an incarcerated parent or family member might have lots of questions, and it is important to create a dialogue with both the child and with the family. Sometimes I over hear a frustrated parent at the grocery store tell their child, ‘if you are naughty the police officer will come arrest you.’ It’s cringe worthy to me because I want children to have a positive view of police officers. I want children to know that police officers are in our communities to help, not to punish or threaten us. These negative images of police can impact children even when they are very young. As an adult, I also know that there are many accounts of police brutality but those few incidents do not detract from the vital role officers serve in our communities. The upsetting stories of tragedy or violence that children might be hear about from their families or crime shows they might see on television leave many children with mixed messages. Read age appropriate books about police and ways officers care for our community. 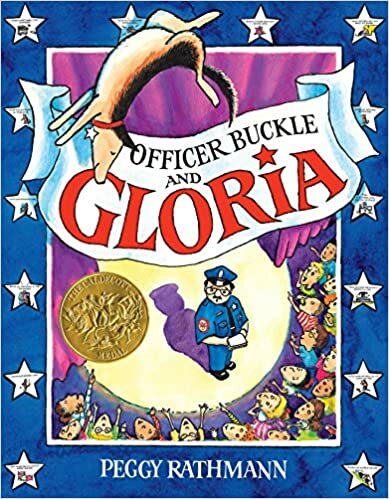 “Office Buckle and Gloria” is a humorous book about a police officer and his dog who present safety talks to children. This books helps frame the conversation how police officers follow rules that help keep us safe, and the dog, Gloria, will keep the kids engaged and laughing! Add a police uniform or badges to the dramatic play center. Post photos of community helpers in your classroom. If possible, post photographs of local police so the uniform is familiar to them. Lego Police set or Police props in the block center give children the opportunity to pretend to be police officers, and through observation and reflection give you a chance to talk about their feelings about helpers in the community. Become pen pals with a local officer and develop an on-going friendship. Ask the local police to bring a cruiser over for the children to sit in. Learn how the CB works, and make a pretend CB for the classroom to use to call for help. Take a field trip to the police department to get a behind the scenes tour. Create a special card thanking the police department, or invite a police officer in for a party. National Law Enforcement Appreciation Day is January 9th, though any day could be a celebration. Host community events (such as a Bike Rally or Walk to School) and ask local police officers to participate. On-going events that build rapport between children and officers is the best way to develop a sense of trust!